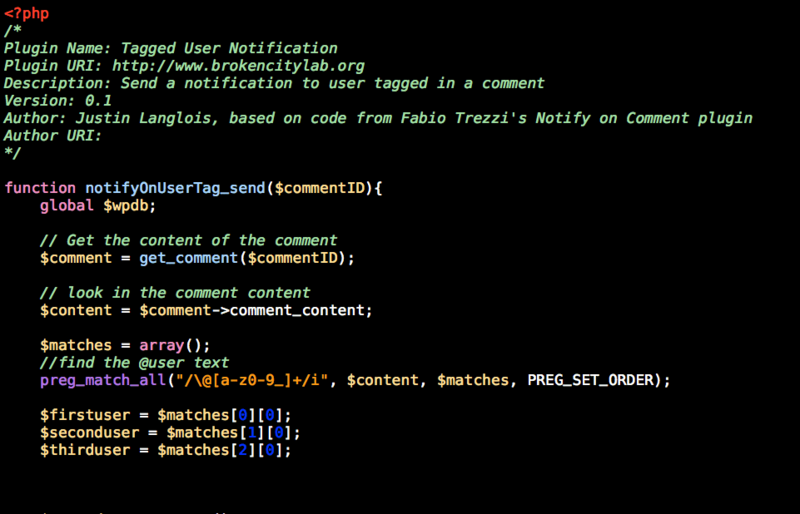 I wrote a plugin by hacking together some ideas based on the Notify on Comment plugin. Essentially, I was looking for a plugin whereby someone mentioned or tagged in a comment (using the familiar @username syntax from Twitter) would be notified. They wouldn’t have had to have made the post being commented on, nor would they have had to made a comment on that post yet in order to be notified. It can notify multiple tagged users in one comment (eg. Hi there, @user1 and @user2) — it will notify both user1 and user2 via the emails they have registered as users on your WordPress install. Now, because this plugin only queries the user database in WordPress, it’s not going to be useful for a wide range of blogs. But, if you’re a multi-author blog looking to shift more of the conversation away from emails or private posts and into the main stage of your blog and its comments, this might work for you. Included in the zip file is all you need to upload it to your plugins directory on your WordPress install. It has a very basic email template, which you can adjust using some of the markup from the plugin file itself. Download the awkwardly named plugin, Tag User Notification. This plugin is exactly what I’m looking for. Unfortunately, it doesn’t seem to be working for me. Do you have a version working in WordPress 3.4.2? Strange, it works on my installation of 3.4.2, even with using Jetpack’s comment plugin. Just to clarify, it only works if you tag users with their usernames who are already registered on the blog.